The Consumer Code for Home Builders first came into effect in April 2010 and is an industry led code of conduct designed to protect buyers of new homes and keep them informed regarding their purchase. In April 2017, an updated Consumer Code was published, containing several alterations made in response to feedback from homebuyers and the evolution of the housing industry. As market leaders, with over 20 years of experience in the property handover industry, our goal is to make sure our clients are always armed with the right knowledge. 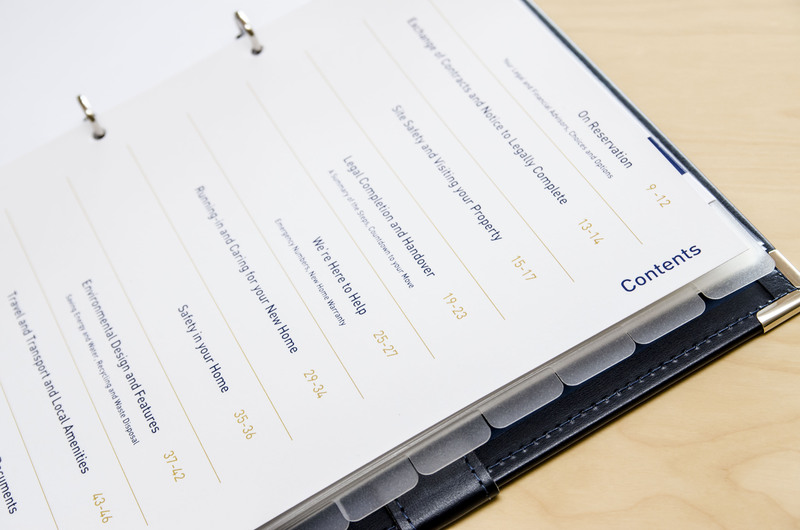 With bespoke, branded new home documents, we help our clients provide the perfect handover experience; your buyers will have everything they need to know about their new home, whilst ensuring you as a developer are compliant with the newly updated Consumer Code. We understand that your house buyers need to be covered by the Code from the point of reserving a property, which is why we ensure our reservation manuals help support your customers when they’re most likely to experience buyer’s remorse. All our reservation products present the Code clearly and ensure buyers are aware of their rights and the service they can expect from the developer. Our homeowner manuals offer comprehensive information to homebuyers, so they have instant access to everything about their new home from day one. The detailed content covers key information, from warranty details to who they should contact if the boiler breaks, ensuring the customer is fully informed in line with the Consumer Code. Comments from the latest review of the Code described “frequent issues arising regarding the ‘completeness’ of the Home at handover.” The updated Code now advises that “the Home Builder should explain to the Home Buyer that there may be minor items outstanding within the Home… and explain what arrangements they will make for completing them.” All our content can include any outstanding details and contains information on what the buyer should expect with minor issues, such as cracks appearing during the drying out period of their new home. Other comments on the Code review stated that “the Home Builder should also make it clear that they are responsible for remedying relevant defects arising under the Home Warranty defect period” and that “Home Builders should now give the Home Buyer the health-and-safety file for the Home”. With easy to understand home warranty information and safety advice, our homeowner manuals ensure you’re fully covered. There is also a new definition of a ‘vulnerable customer’, for example someone who is visually impaired, whose needs “should be considered at all times”. We’re big believers in providing a product that is suitable for everyone and can provide large print or simplified manuals for those who require it.